Browsers take in the literary delights at the annual Bookstock literary festival, held in Woodstock over the weekend. WOODSTOCK – It’s not called hoarding when you pile up the books. Cindy Martin of Andalusia, Ala., was one of many visitors who left with an armload of fresh purchases. 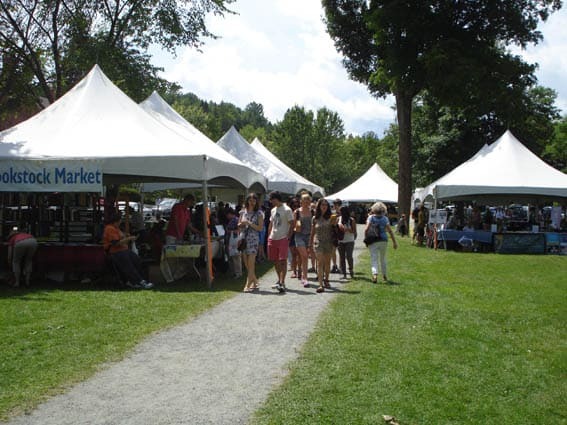 Every year, Bookstock: The Green Mountain Literary Festival attracts readers and authors to the town of Woodstock in central Vermont to hear the poets, meet new authors, and attend readings on wide-ranging topics from history and psychology to more prosaic subjects as retirement, gardening and cooking. This year, the Coolidge Foundation sent its education director, Diane Kemble, to spread the word about the 30th U.S. president. Over in the vendors’ area, the state of New Hampshire had a strong presence this year. Hobblebush Books is a small specialty press based in Brookline, N.H. Besides their line of books, the company also specializes in cover design, and it assists small publishers and academic presses. Publisher Sid Hall said his company works with such schools as Harvard and Boston University. The company also helps those who self-publish to create their final products. Hall said this was his first appearance at Bookstock. Another first-time vendor came from Whitefield, N.H., in the far northern part of the state. Rebecca Matthews, accompanied by her husband and daughter, writes fiction for the Christian market. While many writers of such fiction publish on their own, Matthews has found a publisher for her work. She said her work has been well received thus far. Ron Miller, Bookstock’s executive director, said things had gone well this year and that attendance had been good. Bookstock runs for three days every July on a Friday, Saturday, and Sunday. For more information visit bookstockvt.org.